Sainted Peter, Metropolitan of Moscow, was born in Volhynia of the pious parents Feodor and Evpraksia. Even before the birth of her son, the Lord revealed to Evpraksia the blessed pre-chosenness of her son. At 12 years of age, young Peter entered a monastery. He successfully studied the book sciences of those times and eagerly fulfilled his monastic obediences. The future saint devoted much time to an attentive study of the Holy Scriptures and he learned iconography. The icons, written by the Monk Peter, were distributed to the brethren and to Christians visiting the monastery. Because of his virtuous and ascetic life, the hegumen of the monastery had the Monk Peter ordained to the dignity of priestmonk. After some number of years of ascetic deeds at the monastery, the priestmonk Peter, having gained the blessing of the hegumen, left the monastery in search of a solitary place. At the Rata River he made a cell and began to pursue asceticism in silence. Afterwards at this place of his ascetic exploits was formed a monastery, called the Novodvorsk. A church in the Name of the Saviour was built for the arriving monks. Chosen as hegumen, Saint Peter guided his spiritual children, never becoming angry with a guilty monk, but rather by word and by example he instructed the brethren. The virtuous hegumen and ascetic became known far beyond the bounds of the monastery. The prince of Galich Yuri L'vovich came frequently to the monastery to hear spiritual guidance from the holy ascetic. One time the Vladimir Metropolitan Maxim visited the monastery, in his travels through the Russian land with words of instruction and edification. Having received the Saint Maxim's blessing, Saint Peter offered him as a gift in return an image written by him of the Uspenie (Dormition) of the MostHoly Mother of God – before which Saint Maxim until the end of his days prayed for the salvation of the Russian land entrusted him by God. When Metropolitan Maxim died, the Vladimir cathedra-chair remained for a certain time unoccupied. The Greatprince of Vladimir, – at this time it was Saint Michael of Tver (Comm. 22 November), – dispatched to the Patriarch of Constantinople his chosen like-minded associate the hegumen Gerontii with a petition that he be elevated to Metropolitan of Russia. On the suggestion of the Galich prince Yuri, hegumen Peter also set out to the Constantinople Patriarch for consideration to the hierarch cathedra. God chose Saint Peter for the nourishing of the Russian Church. The Mother of God appeared to Gerontii, sailing amidst the Black Sea by night during a storm, and said: "In vain dost thou endeavour, the hierarchical dignity is not allotted thee. That one, who hath written Me [upon icon], the Rata hegumen Peter, shalt be elevated to the throne of the Russian metropolitan". The words of the Mother of God were fulfilled in full: the Patriarch of Constantinople Athanasias (1289-1293) with a council elevated Saint Peter to Russian metropolitan, bestowing upon him the hierarchical vestments, staff and icon, brought by Gerontii. Upon his return to Russia in 1308, Metropolitan Peter after the course of a year arrived at Kiev, and then proceeded on to Vladimir. The chief hierarch was tested by many trials during his first years of guiding the Russian metropolitanate. In its suffering beneath the Tatar (Mongol) Yoke the Russian land was in turmoil, and Saint Peter was obliged often to change the place of his residence. During this period particularly important were the labours and concerns of the saint to affirm the true faith and morality in the realm. During this time of constant journeying throughout the diocese he incessantly instructed the people and clergy about strict preservation of Christian piety. The quarrelsome princes he summoned to love of peace and unity. In the year 1312 the saint made a journey to the Horde, where he received from khan Uzbek an edict, guarding the rights of Russian clergy. In 1325 Metropolitan Peter, at the request of Greatprince Ivan Kalita (1328-1340), transferred the metropolitan cathedra-chair from Vladimir to Moscow. This event had very great significance for all the Russian land. Saint Peter prophetically predicted deliverance from the Tatar Yoke and the future emergence of Moscow as the centre of all Russia. By his blessing, in August 1326 in the Moscow Kremlin was put down the foundation of the cathedral in honour of the Uspenie (Dormition) of the MostHoly Mother of God. This was a profoundly symbolic blessing by the chief-hierarch of the Russian land. On 21 December 1326 Saint Peter expired to God. The holy body of the saint was buried in the Uspensk cathedral in a stone crypt, which he himself had prepared. Many miracles were done through the prayers of the saint. Many healings even were done secretly, which testifies to the deep humility of the saint even after death. The deep veneration of the Chief-hierarch of the Russian Church was affirmed and spread throughout all the Russian land. In 1339, 13 years later under Sainted Theognost (Comm. 14 March), Saint Peter was enumerated to the ranks of the saints. And at the tomb of the saint, princes kissed the cross as a symbol of fidelity to the Greatprince of Moscow. As a particularly venerated protector of Moscow, Saint Peter was called on in witness in the drawing up of government treaties. 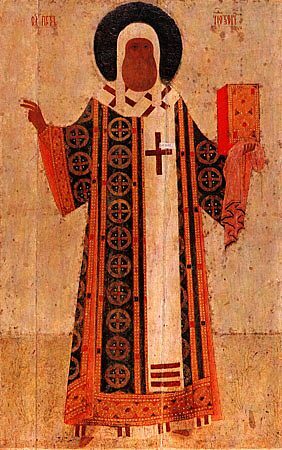 The Novgorod people, formerly having the right to choose their own bishop of Saint Sophia, after their annexation to Moscow under Ivan III, gave promise with an oath to establish their archbishops only at the grave of Sainted Peter the Wonderworker. And it was at the grave of the saint that Russian chief-hierarchs were named and chosen. The Russian chronicles make mention about him constantly, and no significant state undertaking was initiated without prayer at the grave of Saint Peter. In 1472 and 1479 was made a transfer of the relics of Saint Peter. In memory of these events feastdays were established for 5 October and 24 August.